We couldn’t do what we do at Wheels 4 Life without the support of our donors. One such regular and generous donator lives in Australia and he made us aware of a charity,Sonlife Africa (registered in Australia) which in turn works with a Kenyan charity, Cornerstone and an exceptional man named Bishop Francis Kamau. Bishop Kamau told us about the work they do throughout their community, which is spread quite far and wide in a region near Nairobi, Kenya. So many people in developing countries worldwide need transportation, both for themselves and the loads they have to carry, whether that be water, crops, bricks etc. 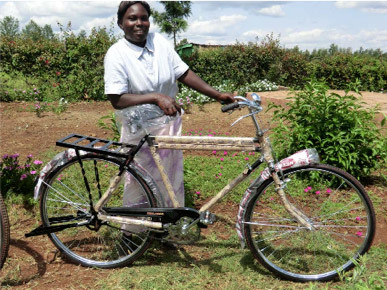 Bishop Kamau requested a total of 600 bicycles to be used for a variety of purposes from school children travelling to school, to farmers transporting their crops to the market, to widows using a bike as a tool to help them make a living to support their children. We would eventually like to provide the Cornerstone Community with the 600 bicycles requested but for now we have given them 110 with a further 100 promised before the end of 2012. This is a photo of Eunice, she is 36 and has 6 children, she has a daily 12 km commute and her bicycle makes life a lot easier for her. Not only can she use it to travel to the market, it means that she can transport several containers of water in one trip meaning more time with her children and the ability to earn more money. Just look at the smile on her face! One bicycle doesn’t just change one life, it changes several and that is what Wheels 4 Life is all about.